Pubs: Linnanes Lobster Bar is famous for its seafood specialities. Their menu also offers a wide varity of meat and vegetarian dishes. Delight your palette here with superb cuisine and a pint of guinness!! Shops: You can buy fresh fish and shellfish from our local fish shop behind Linnane's by the quay. Also buy your delicious vegetables, fruits, cakes at our local farmer markets on friday in Kinvarra and saturday in Ballyvaughan. The Russell Gallery: fine art - from their tuscan corner organic wine, olive oil and honey around the corner! Shannon Airport: 1 hr 30 mins. Situated in the town land of New Quay nestling at the foot of the Burren mountains Bequia cottage is ideally situated on the seashore affording panoramic views of Galway Bay and the surrounding Burren landscape. Ballyvaughan is a small fishing and trading port with sea fishing, seafood pubs and craft workshops being the main attractions. 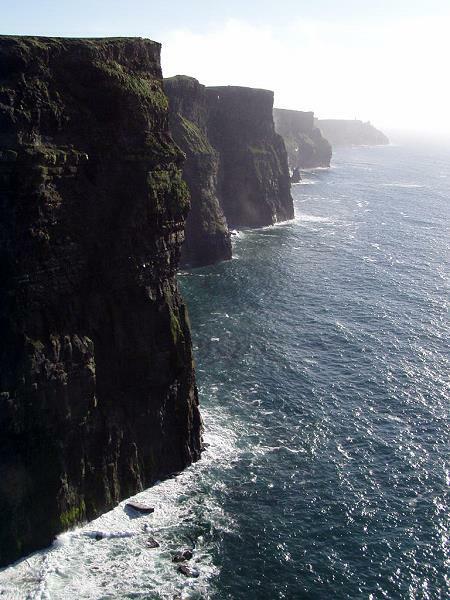 Certainly the Burren are the main feature of the area but there are many other sights worth a visit: The Cliffs of Moher are just half an hour from the house. The Aran Islands can be reached by boat from Doolin (30 mins) or from Galway (45 mins). This lively city does not only attract through its shopping centres but also through the cultural activities, the cathedral and - last not least - through the Galway Horse Races. It also the gateway to the romantic wilderness of Connemara. 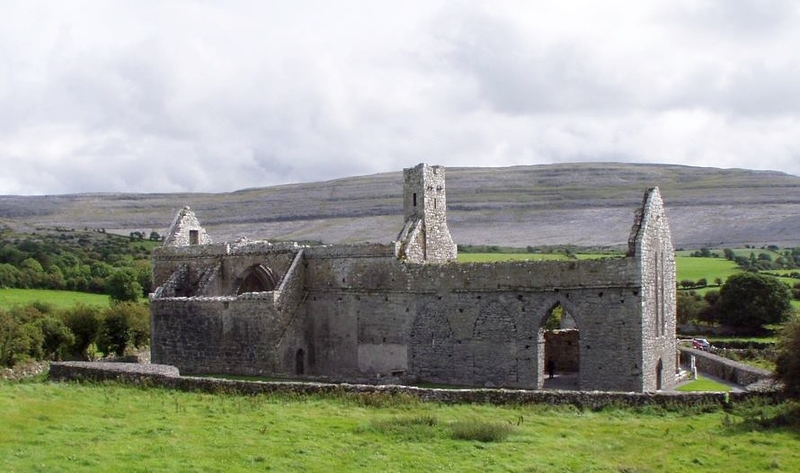 Corcomroe Abbey is just one of the many medieval ruins in the area. The remains of the cistercian abbey dates from the 14th or 15th century. The excellent masonry features delicate floral ornamentation. 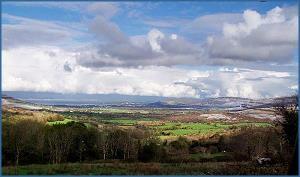 The Burren are about 500 sq.kms of lunar-like limestone landscape and surely one of the wonders of this world. Its apparent bareness nurtures an internationally famous flora. 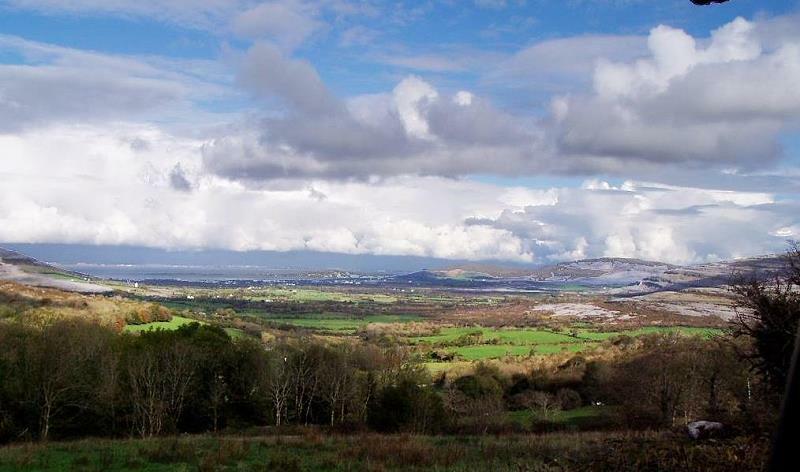 When Stone Age farmers settled in the Burren they found the area forested. By late medieval times the felling of timber and the grazing of cattle produced to-days skeletal landscape. Man has left a mass of evidence of having lived on the Burren for thousands of years. Material remains abound, including megalithic tombs, stone and earth ring forts, round towers, medieval churches, monasteries and castles. 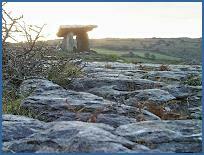 Burials took place in Poulnabrone and other dolmens over a period of 600 years from 5200 to 5800 years ago. .Gaelic Chieftains like the O'Briens, the O'Connors and the O'Loughlins - who were the Princesses of the Burren - had their castles here. One at least, Gleninagh Castle was inhabited until the middle of the 19th century. The Burren coastline shows a dramatic and picturesque mixture of stone, beaches and a crystal clear blue Atlantic ocean. The Aran Islands are an extension of the Burren landscape. There are numerous caves, one of which, Ailwee Cave is open to visitors. You'll get an inside look into the area and its mysteries if you visit the Burren eXposure in Ballyvaughan, just a few minutes from the house. This charming semit-detached cottage on ¾ acre organic garden is ideally situated in a very quiet area at Galway Bay and is only 10 minutes from Ballyvaughan, Co.Clare and from Kinvara, Co.Galway.